Also, is it possible to have an original tag with another copyright tag? The girl silhouette is almost definitely Misaka_Mikoto, but the mech's original, so an argument could be presented . . .
Yeah it is possible to have an original tag mixed in with another copyright tag. Meh...I'll just leave the original tag applied to this post so it's easier for people to understand where the mech came from. 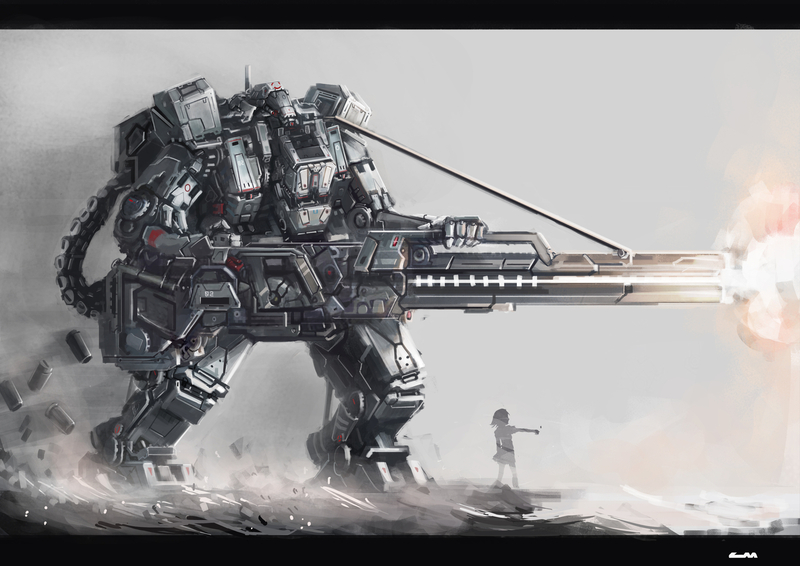 That mecha look freakin' awsome! I also love the artists nam, haha! Well Mikoto is clever... So I wouldn't go against her. If she was fighting the mech I reckon she'd win. Probably the mecha. It has an armored body. Although if I had to LIVE with Mikoto, I would probably choose her given how easily she would blow a fuse both figuratively and literally. I wonder why there are shells coming from the back of it. If it is a railgun, it should be able to propel the projectiles with only electricity, and not need any powder or propellant in shells. Maybe they store energy? Nice idea having the gun strapped to the mecha's shoulder like that though. i.e. Converting chemical energy into magnetic (flux) energy. Whether this is feasible (and practical) for powering a railgun (or coil gun for that matter) is something I'm not sure about. It would allow the apparent rate of fire that gun seems to be achieving. I don't know of many ways to develp a rapid-fire rail-/coilgun due to the amount of instantaneous power needed for each shot. [...] Nice idea having the gun strapped to the mecha's shoulder like that though. I actually find that implausible and kinda ridiculous, but that's just me. i.e. Converting chemical energy into magnetic (flux) energy. I think there is much easier explanation to this. Shells with simple gunpowder accelerates projectile as much as it can, then projectile with velocity 1-2km/s gets onto charged rails, and they accelerate projectile to the highest speed (5-20 km/s). The problem is, if projectile was accelerated to that high speed only by elecric rails, it would take enough time to burn a whole projectile to plasma, which also can be accelerated by rails (and gun actually will be plasmagun, but that plasma is not stable and quickly desintegrates). And gunpowder simply allows to save lot of electrical energy. I heard that USN are now developing and testing those kinds of guns, and are planning to install them to future atomic battleships. Sounds a little strange. We got rid of all our battleships a while ago when aircraft proved to be so effective. I don't know why we would go back to that, even with rail guns/coil guns. Maybe on other ships? I think there is much easier explanation to this. Shells with simple gunpowder accelerates projectile as much as it can, then projectile with velocity 1-2km/s gets onto charged rails, and they accelerate projectile to the highest speed (5-20 km/s). That's actually a waste of the gunpowder. Coil/Railguns can accelerate an object MUCH faster (60k G's; I don't know of ANY gunpowder weapon that can accelerate that hard) and a bit more efficiently than gunpowder. The staged firing there wouldn't make much sense. Also...There's enough timing issues with coilguns and wear issues with railguns that adding gunpowder into the mix would excerbate the problems. Timing the initial launch via gunpowder in the case of coilguns so the coils accelerate the projectile correctly. Railguns themselves are VERY wear-heavy on the rails already. Imagine gunpowder residue getting grinded between the rails and the projectile as well. Generally speaking, using energy in its natively generated form is more efficient that converting it to come other form first. Conversion induces losses (usually in the form of "waste heat"). The railguns you speak of are being tested for use in gas-turbine powered vessels as well. Navy is researching more efficient shipboard power generation, distribution, and storage systems in conjunction with its weapons development. The US Navy can't afford building a fleet of nuclear destroyers and cruisers after all. No one builds battleships anymore dued to aircraft taking over the direct attack role they used to serve. Now, it's mostly about speed and precision over brute firepower. Most EM research for practical use in the US Navy is for railgun equipped surface ships (mainly destroyers; cruisers tend to be missile boats these days...) and EM rail catapults for aircraft carriers. In any case, anime/manga artists are some of THE worst when it comes to technical accuracy. You'd have to find an artists that also a military otaku or is OCD about (semi-)accurate portrayal of mechanics/engineering to get something that makes physical sense when it comes to mechanical designs. That depends on the round mass. While tanks can accelerate rounds at near 30 kG's, AK-47 do this at 63 kG's (counted in my head). I guess electrical weapons dont have those kind of limits that chemical accelerators do. But, if they want to shoot heavier rounds at higher speed and to keep barrel (rails) short, they will need greater amount of elecricity -> powering capacitors will take longer -> firerate drops... if I think this way, I really dont see any problems to use gunpowder as an additional accelerator. Generally speaking, using energy in its natively generated form is more efficient that converting it to come other form first. And what are the differences between converting elecricity to kinetic energy and converting chemical reaction energy to kinetic energy? I've read they are developing special cooling systems to their railguns now. My point is: railguns and coilguns are limited to electrical technologie's limits, and gunpowder can make developer's life happier. In observable future, railgun has chances to be installed in Zumwalt class destroyers (under developing). Let's move the tech talk to the forum now. I can't afford to set a bad example ^_^; We'll use forum #841 for now. the girl or the ultra mega badass hyper cool robot?